data modeling - Eric D. Brown, D.Sc. What do you think of when you hear the term ‘data modeling’? Just typing ‘data modeling’ almost made me go to sleep. Who am I kidding…I’m a data geek and this stuff is interesting…but some folks aren’t quite as excited by this stuff as I am. 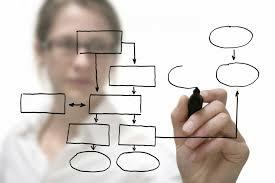 Data modeling has many different definitions and connotations. For many within the IT world, data modeling conjures up database administrators sitting in room designing tables and relationships. That type of thing does make me sleepy…but it is a necessary step in any data storage workflow and in your data strategy. Oh. What’s that? You don’t have a data strategy? Here’s why: Much like business strategy, data strategy provides guidance into how your organization is going to capture, manage, use and integrate your data into your business. Business strategy helps inform and guide data strategy while your data strategy helps you build better business strategies and tactics. I’ll assume you have a data strategy in place. Because you do need one before you dive into data modeling. Sure, you can build data models without any type of strategy but I can guarantee you those models will be changed multiple times over time since they weren’t informed by any strategic thinking. These seem pretty straightforward (and they are) but these steps are the key steps needed to undertake a data project. These aren’t earth-shattering revelations about how to do data modeling, but making sure these steps are covered in every data modeling project has helped me, my colleagues and my clients build some great data models, which led to great outcomes from the data we had. If you don’t take the time understand your data, how do you know that the analytics that you build with that data is accurate? You don’t. Spend the necessary time in the modeling phase of your next data project and you may be surprised at the quality of the output of your data analytics.